In my constant quest of saving money, I’m always looking for ways to cut down my spending. And when I went grocery shopping and saw that the most expensive item on my list was laundry detergent, I knew I had to do something about it. I went to my favorite library – Google – to see if I could find a cheaper alternative and quickly found hundreds of recipes to make your own laundry detergent. Since I’m a big proponent of Do-it-yourself I decided to give it a shot. I first decided to make a liquid laundry detergent and even though I liked it a lot, it took too much space, it was very heavy to carry, and it took longer to make. That’s why this time I decided to go with the powder kind, which takes about five minutes to make, it’s easier to carry to our laundry room (located outside our apartment), and it doesn’t take too much space. 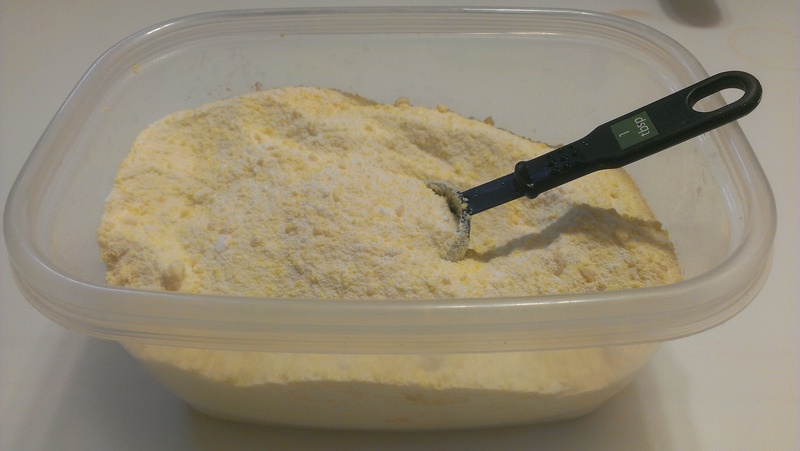 If you want to know how to make liquid laundry detergent, check out this recipe at Frankly Frugal. Making your own laundry detergent will not only save you money, but it is also better for your health. Brand name detergents are full of nasty chemicals that are not too good for you. The recipe below contains only three mostly natural ingredients that don’t pose a health hazard. I found all of the ingredients in the laundry aisle of my local supermarket, but you could also order them online. Borax – Is a naturally occurring mineral made up of sodium, boron, oxygen, and water. I bought a 76-oz box (makes about 16.5 batches) of Borax 20 Mule Team Detergent Booster for $4.49. Laundry Bar Soap – It’s just that. A heavy duty laundry bar soap. I bought a 5.5 oz Fels-Naptha Laundry Bar Soap (makes one batch) for $1.29. The recipe below makes enough laundry detergent for 64 loads. 1. Grate the bar of soap using your typical cheese grater. 2. 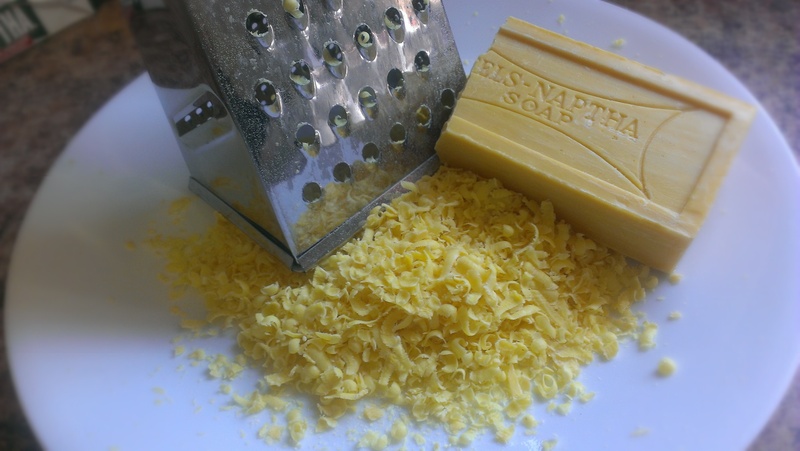 Combine grated soap with the washing soda and borax. Mix well. 3. Store in a closed container. I wish I could tell you there’s more to it, but there isn’t. It really is this simple. After grating the soap, I combined all the ingredients in a food processor to turn them into a finer powder that’s easier to dissolve. If you do this, let the dust inside the food processor settle before opening. You don’t want to inhale laundry detergent. Use 1 Tablespoon (Tbsp) per load. You might want to use 2 Tbsps for heavily soiled clothes. 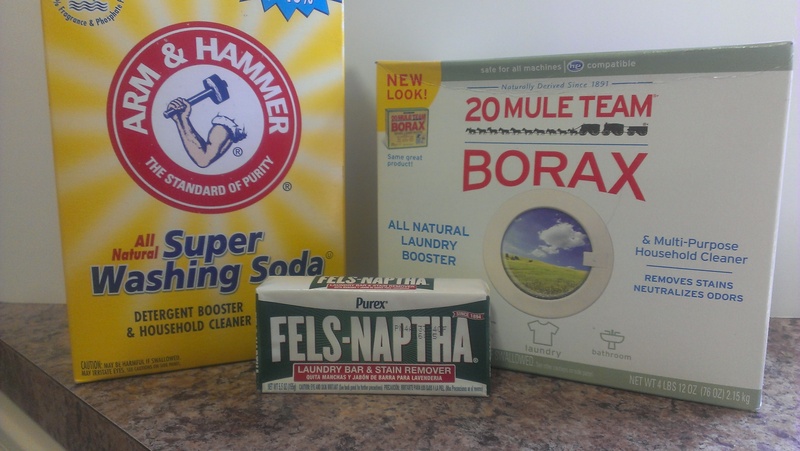 Since this is a personal finance blog and saving money is our main theme, let’s break down the cost per load of the homemade laundry detergent vs. a brand name. For this comparison I chose Tide Original because it is one of the most popular brands and it is not the most expensive (not the cheapest either). Now we have to do some math for the homemade laundry detergent. Each batch = 64 loads. Washing soda = $2.99 for 6 batches (6 x 64 loads = 384 loads), or $0.008 per load. Borax = $4.49 for 16.5 batches (16.5 x 64 loads = 1,056 loads), or $0.004 per load. Laundry Soap = $1.29 for 1 batch (1 x 64 loads = I’m not even), or $0.02 per load. Total per load = $0.008 + $0.004 + $0.02 = $0.03 per load. That’s a difference of $0.18 per load! I previously used the liquid recipe with great success and have been using the powder form for over two months now. Granted, my clothes are not heavily soiled because I don’t have children and I don’t get dirty at work, but I sweat and get as dirty – if not dirtier – as most people. Even Kate, who is super picky about smells, likes the smell of the detergent and the freshness of the clothes. And nobody at work has complained that I smell yet, so that’s good. This homemade laundry detergent is so inexpensive and easy to make that everybody should at least give it a try. Have you ever tried to make your own laundry detergent? If so, how did you like it? I keep entertaining the idea of doing this…your post has brought me a huge step closer because it really isn’t complicated! I wish our homemade laundry soap experience went better. We probably should try again but it didn’t seem to get our clothes clean. That’s unfortunate Debs, even our workout clothes come out smelling fresh. Like I said, we haven’t tried washing heavily soiled clothes yet, but those don’t get too clean with store bought detergent either. I work in a resort and one of the perks is free dishwasher and detergent. It’s also time saving because there is 3 machines we can run simultaneously! You are right when you say that it is better for our health, I had a friend who was allergic to most commercial detergent. The term “fragrance” hides tens of thousands of unregulated chemicals. Since it’s a “trade secret” you and I will never know what’s in there. you’re right about the fragrance Renaud, and way to go on the free dishwasher and detergent. That’s probably saving you a lot of money. Hah I thought you had mentioned you were making this for awhile, glad to see a post on it! I haven’t tried the dry stuff yet and not sure if I will. My experiment with the liquid detergent is going great and will save me money over the long haul. Glad it is saving you money as well! Also, thank you for the shout-out on my article for the liquid soap! I also tried the liquid kind and liked the results, but we now live in a place where our laundry room is about 50 yards away so we would have to use a second container to carry our detergent. I figured the powder would be easier to carry. You’re welcome about the shout-out, your post is valuable. Any ideas for homemade fabric softener? I can’t really say about sensitive skin or kids because I don’t have either, but from my research on the matter it seems like it’s okay to use since it doesn’t use harmful chemicals. I don’t know about fabric softener, but I can check in the library, I mean Google. White vinegar!! Best and cheapest fabric softener. I’ve been using it for 3 years now and haven’t looked back! Yes your clothes smells a tad like vinegar when they are wet out of the washer but once dry, they just smell fresh. I can say it is fine for sensitive skin. The dry detergent uses basically the same ingredients as the liquid soap does. Only thing I would suggest it maybe a different bar of soap. When I was buying soap I passed on the Fels-Naptha because it said it could irritate skin and I choose a bar of soap that was more natural. Previously I have only been able to use Tide or All brands there were free and clear. Other “free and clear” brands would still irritate my skin. This is awesome.. Your dedication to frugality is very impressive! I have also heard that there are irritants in many commercial detergents, and it would be great to go the natural way..
jefferson recently posted…Where Do You See Yourself in 25 Years? I’ve never seriously considered making my own laundry detergent, but you make a good case for at least giving it a shot! Yes, those pods can get expensive. I also read that they are a big hazards to toddlers because they mistake them for candy and eat them. They shouldn’t be within reach of children, but that’s another discussion. I have got to try this! If it works, I am sure that it will save me money. I can’t wait to test it out and give it a go. Thanks for sharing!